Well took the ski out today for it's maiden voyage. BIG thanks to this forum, as well as Al and Beerdart for getting me out of a jam. Everything went real well, pretty much stuck to the recommended procedure on break-in. Still working on tuning, as after a little while of idling it'll bog if you get on it. But if you've been running at speed for awhile, slow down to idle for only a sec and then hit it, no prob. Also, ski was only getting up around 5k rpm. I was trying to keep my highs a little on the rich side for fear of seizing. Plugs as a result are oily and black. Much adjustment to follow, just wanted to prevent any lean situation on shake-down. Cylinders seem to be a bit warmer than recommended. They felt like the surface of a black car in summer. Nothing you could touch for a few seconds. Things didn't get TOO hot, and no discoloration anywhere, so I continued break-in. Water IN felt cool... water OUT felt very warm. Guess it's working properly. Ski ran relatively fine all day. I recall reading somewhere on here that the motor runs a bit warmer on break in. Perhaps that's the case, or when I get the mixtures correct it'll run cooler? All in all, good times were had by all. Hadn't been on a ski in 16 years. Thanks again. Congrats, sounds pretty good. She will run a bit on the hotter side when breaking in, but it won't run cooler as you lean it out. Just the opposite. Are you sure you installed your head gaskets in the proper position? They are meant to mount 1 way only. As for the oily plugs, are you using the oil injection or premix? Premix for break in should be regular dino oil at 32:1 ratio. If you're using injection, you should add a little oil to the gas tank to compensate. Thanks for the response. Yeah I'm running premix at 32:1, removed oil injection. On the head gaskets I didn't assemble this motor, but went out to take a look. This gasket look correct? That is correct. You can prob lean that cyl out a fudge more even for break in. 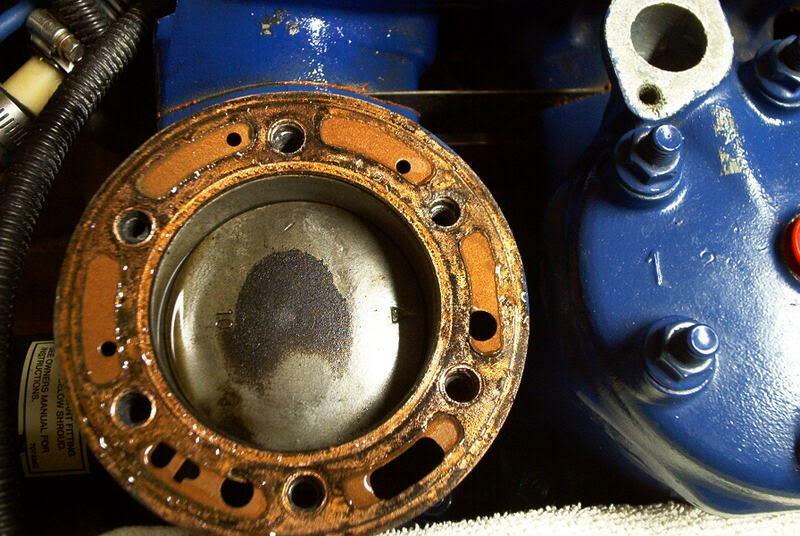 I see some oil sitting on top of the piston and wash is real rich. Prob why your plugs are oily. Cool, thanks. As far as heat goes, I suppose I'll keep on keepin' on and monitor closely unless things really get out of hand. Other than that, in this stock form I don't really know of another way to verify cooling flow once in the water or while under power. I really want to install pissers as it's a clear and visual way of seeing that the cooling system is working. Plenty of fuel, how do the other cylinders look? The other two look very similar, plugs too. Really the ski was running real good considering how far the fueling seemed to be off, and I'm continuing to dial it in. Once past some of the blubbering above idle it ran fairly smooth up to a peak rpm around 5k, but was still doing a small amount of that blubbering stuff up top. What I'm really concerned about is the heat. All three cylinders were just plain hot, but not hot enough to immediately sizzle water droplets that fell on them. Water droplets still just beaded off. Sometime this week I hope to install some pissers, and would like to use that as cooling verification and as a tuning tool on my next trip out. Some info that might help...when running on the hose, it would take a good few minutes for the center and then the mag cylinders to cool, almost like it takes a bit for the cooling system to fill or something even though a good amount of warm water is flowing out the rear. Large hose on water bar is pinched closed while on garden hose. Not a good day on the water! First day on the water! Stall issues?